US FDA recommends to lower dose of drug containing eszopiclone from 2mg to 1mg once in a day at bedtime. 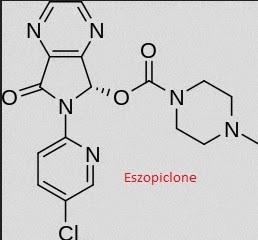 Eszopiclone drug of class cyclopyrrolones is a sedative hypnotic drug, which is used in treatment of insomnia, its earlier dosage was 2 mg at bed time. US FDA have recommended to reduce the dose to 1mg from 2 mg once a day at bed time, this was suggested after looking at the outcome from clinical trial where in patients taking 2 mg dose found it difficult to cope up with the activities in morning even after 8 hours after drug is taken in night. Eszopiclone dose of 2mg is found to interfere in activities which require motor skills like driving and machine operation. Therefore US FDA require the starting dose to be reduced to 1 mg, from 2 mg, in event drug dose is required to be increased it should be closely monitored by physician and it can be increase to 2 mg if required. Eszopiclone enhances activity GABA and act as GABA receptors agonist, activation of GABA receptor result in to suppression of CNS activity, and induces sleep. Mode of action is similar to that of benzodiazepines.